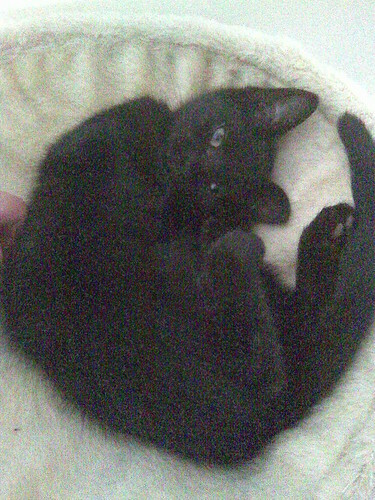 We were down to one very self absorbed house cat, she won't sit on laps and only tolerates being stroked is she wants feeding,then a friend asked me to take a 6 month approx male black cat as she was leaving her livery yard and didn't want to leave it behind, a very nervous cat arrived and we left him to settle in, a few days later he produced 3 kittens, all female, 2 tabbies and 1 tortie, mum is now very friendly,we will keep the kits but they will be spayed. Well, I must appologise for the quality of photos as they are from my phone, which would seem is rubbish!!! But here is Mishka... as you can see she settled in so well, and very quickly! and here with Teddy.... not sure what they were watching! It is loveley to hear such loveley cat stories... My first ever cat was a beautiful tortie and white who was found by my next door neighbour in a bag in a graveyard. She was the most loving and gentle cat ever. She was so clever we had to turn all the door handles upside down in the kitchen as she used to open them on a night time so she could come upstairs...And she used to follow me to school, then when I tried to pick her up she used to run away. I had to actually get her into the school building so I could catch her and take her home! 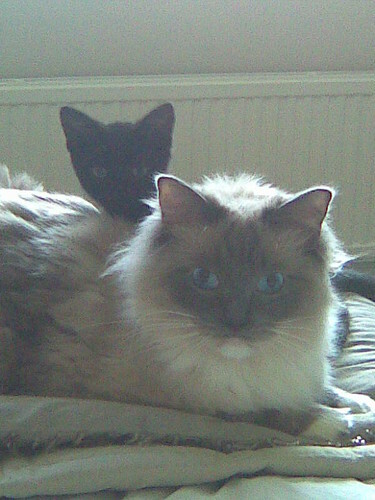 Sadly she was hit by a car when she was only very young, which was the reason I got 2 Birmans at the time so they could stay indoors. Keep your kitty pics coming!..... oh, and I am still on the look out for another Ragdoll. I would love a blue bi-colour, so if anyone knows of some.... let me know please!! !